Computer Graphic of details, objects and spaces. Stills, Motion and VR. Bang & Olufsen AV9000 meets Fstorm. An icon of industrial design from the 90s revisited in CGI. B&O, a pioneer of UX Design. It's a matter of fact that when we grow old we tend to look at things of the past as if they were better. Maybe it is what they call nostalgia and it is definitely the case with this Bang & Olufsen AV9000. The most glamorous television from the 90's and definitely an icon of industrial design of this era, when manufacturers weren't forced to renew their products every 3 months and objects seemed to hold more value and last longer. The crude reality is that we're much better off today than 20 years ago in terms of technology. There are no reasons why today you would want a tv with lower resolution than your smart phone, a huge CRT, a narrow choice of channels and the price tag of a motorbike. It was the time of MTV booming in Europe, of the parabolic antennas, of Nirvana leaving space to Prodigy, when Apple wasn't Apple as we know it and Iphone wasn't a word yet. 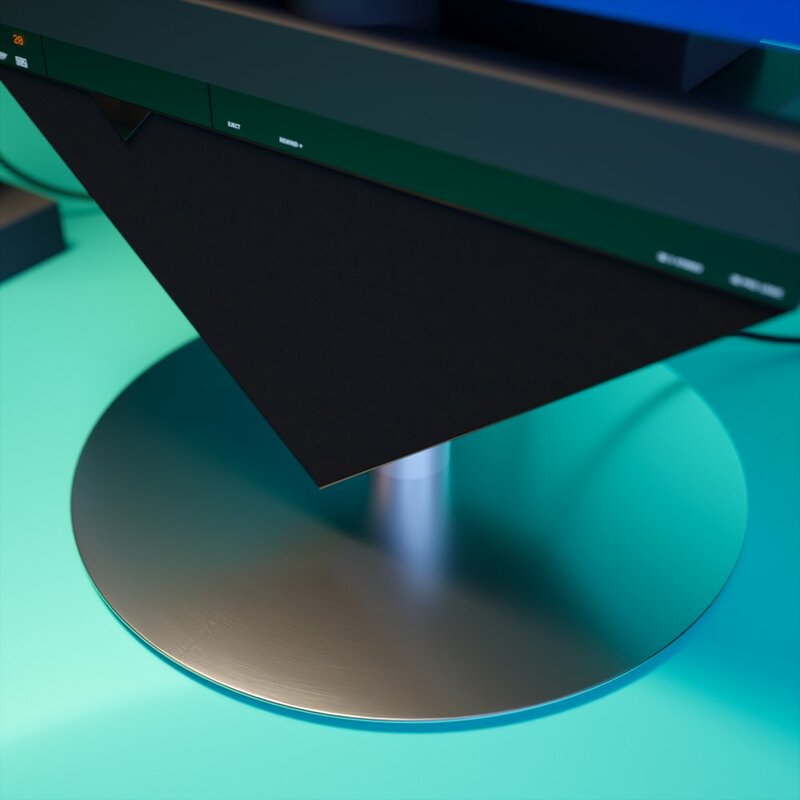 Bang & Olufsen is the highest expression of design when it comes to sound and video. They were first in combining beautiful design with high quality components and simplicity of use. They were a pioneer of user experience design with the Beolink system. There are few brands in the worlds able to arouse a sense of luxury and exclusivity like B&O. We've chosen the AV9000 as a case study to demonstrate how CGI can facilitate the work of product and industrial designers. CGI loves Design loves CGI. Analyse form and function of a product. Evaluate proportions, materials and finishes. Simulate scenarios and place the product in a virtual context. Create presentations. Steve Jobs and the keynote docet. Commercial for TV and web. Dyson is an example. Design can't live without 3D computer graphics. We are often approached by studios with an idea and few sketches of a product to visualise for a presentation. Other times we get requests from companies to create images for a catalog. Sometimes we get agencies commissioning high-res images to advertise on magazines and billboards. Alternatively, animation is the new medium to advertise online. Being it a video to upload on Vimeo or Youtube, a web-commercial or a technical video to showcase the functionality of a product. 3D animation is becoming technologically more accessible and economically more affordable and the request for it is definitely growing. This is a sample of the work we create every day at Arteconi CGI and an insight into the production pipeline of creating a 3D animation using the very latest technologies to present an industrial design product to a photorealistic level. The nerdy corner, again. Fstorm and GPU rendering. From a technical point of view, a "little" revolution is happening in the world of computer graphics. We're slowly migrating the rendering task from CPU to GPU. Processor to Graphic Card. There's a lot of pros and cons but we can't deny that the industry is moving in that direction and sooner or later GPU will take over for few reasons. It is more scalable, more powerful (this has to be demonstrated...) and opens up new possibilities. Scalable because you can upgrade a computer with a couple of graphic cards and have a serious boost in productivity with a relatively small budget. Powerful because the design of GPU makes it more suitable for heavy computational tasks like ray-tracing . Not in all circumstances though, we have experienced longer rendering times on GPU than CPU in complex scenes. Another payoff is that the amount of memory available on the GPU is limited so we have a restriction on complexity of the scene and texture that the GPU can handle. Redshift, a hybrid rendering engine, has overcome the problem thanks to it's out of core architecture, so, utilising the best of both worlds. A lot is in development but so far, the future looks brilliant. The rendering engine is unbiased so it delivers the best photorealistic quality. Easy to use, there is very few parameter to set up. Impressive speed compared to other GPU product on the market. Lighting and Shading in Fstorm are the most efficient thanks to its progressive engine that refresh the image every few seconds and allows you to find the best camera angles. It is perfectly integrated with 3DS Max and its shading system is very close to other rendering engines. If you can shade in Vray, Arnold, Corona you won't have any issue with Fstorm. Those features together make it a perfect choice for rendering and animation of product design. Again, I insist, it is in beta version so I won't suggest it if you're not an expert and you're not ready to accept a few compromises and limitations. 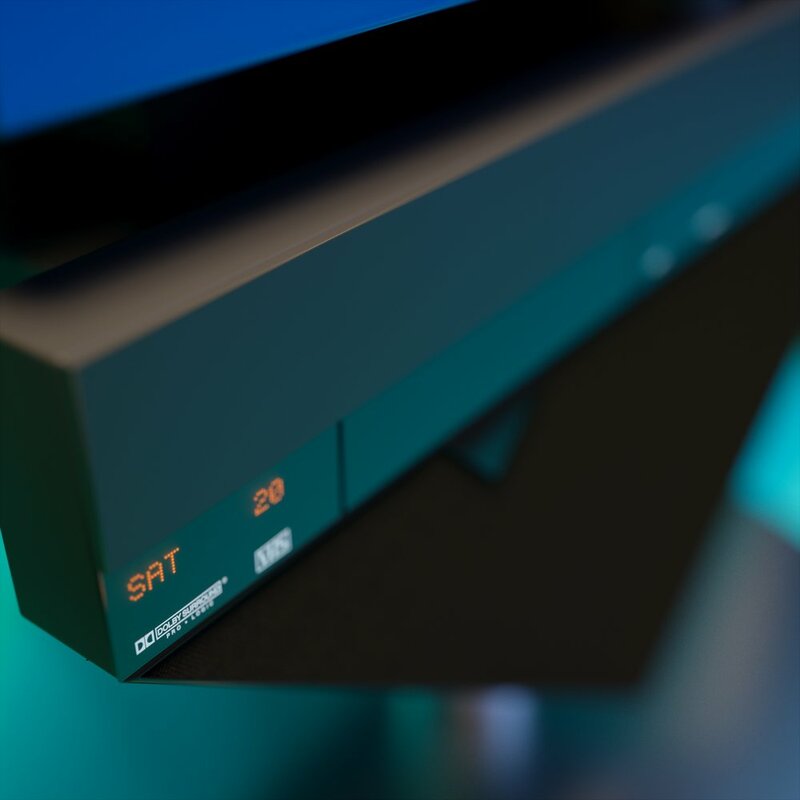 3D Modelling this TV has no different approach to any other 3D modelling job but we wanted to highlight an important element of product and industrial design renderings: attention to detail. 3D artists always have to see the big picture and understand how far they should get into details. The complexity of a scene decides how much time to spend on an element according to few factors: relevance in the scene and distance from the camera. If the object is the hero of the shot, make sure to have everything modelled and in place. While, if an element serves just to fill a scene and won't be seen from close, you should not waste time with it. If this TV was seen from the distance, just used to fill a room of a building and seen through a window, it would have been composed of just a few boxes, cylinders and an extruded triangle packed with a single texture. Since our B&O AV9000 is the hero product of the animation we have to give maximum attention to it. Make sure that every corner has its own chamfered edge and, possibly, keep the geometry simple. Use quad polygons ready to be used with subdivision surfaces (turbosmooth in 3DS Max) so that any curved element won't lose resolution when you get closer. To make an example: The chrome part of the speaker is essentially a cylinder. If you define a cylinder with 16 faces it will look completely round from the distance but if you zoom in it will look faceted. One way around to this issue is to increase the number of faces. In that way though, you'll increase the complexity of your object. That won't be a problem if the model is finalised but most of the time you'll have to change it again, review it and amend it. We're talking about design here so your model is never finalised. The best way to approach it would be to base the cylinder on 8 faces and then use a turbosmooth to raise its resolution. You'll have to add few edge loops towards the extremities but, in this way, your model is simple to control and still high resolution. To be able to use turbosmooth on your model you have to keep your 3d model clean and free from n-gons. Quad polygons keep your 3d model free from pinches and strange deformations. Another tool very useful is smoothing groups but, for this kind of work, I prefer the full control that edge loops offers. Fundaments of hard surface modelling are imperative in this kind of job. Check Grant Warwick's website if you don't know what I am talking about. Moire' pattern and other imperfections. In more than 10 years I can confirm that I have never heard a client asking to make his product look imperfect, aged or dirty. You are showcasing a piece of design so it has to look at its best. Perfect though, often looks way too CGI. An expert 3D artist knows how to add subtleties and variations to keep things more natural. It's still a flawless composition but I have added a few tricks to give the animation a more organic look. First of all, I have added a dirt texture map on the reflection glossiness of the green curved wall to break the reflection. This simulates a bit of dirt on the floor. It could be hair or dust, it just makes it look less boring. Then I have added a fingerprint texture on the front glass of the television and the rest of the lacquered surfaces. Maybe it is a bit overdone in the video but I didn't mind it. It is visible when the tv rotates and reflect the yellow light. Both the reflection maps are very subtle and visible under certain light circumstances. Johannes Lindquist has a couple of freebies scenes and textures on his website http://www.archvizscenes.com/ and is also one of the best Fstorm artists around. The metallic round base has a bump map to simulate the anisotropic effect of brushed metal that is not yet implemented in Fstorm. The moire' pattern typical of those TV is recreated multiplying the footage on the screen against a grid of very small circular gradients. The effect is visible on the video at the second 29.00 and is achieved simulating the real layout of a CRT TV. Studio Lighting and Camera Lenses. When shooting product design you have to act as a photographer so a curved wall and a 3 point lighting was my starting point. I have settled for an aqua colour because it is a nice match with the blue colour of the TV. There is a main warm light coming from the left side and a cold fill light from the right side. Then a third white light from above illuminating the whole scene and brightening up the central part of the frame behind the tv. It also acts as a rim light reflecting on the above surfaces of the tv depending on the incidence angle. An important trick to make those images look less CGI is to map the lights with HDRI maps of softboxes and umbrellas like a real studio shot. HDRI and EXR are 16 or 32-bit file formats containing information on the exposure of an image so they include the full dynamic range of a light. Another factor we give lots of attention is the choice of lenses. Bokeh, depth of field and motion blur are the best tool to simulate a camera behaviour and give a cinematic look to a video. In CGI we don't have the problem to compensate the exposure with the aperture so we're creatively free but, if you want to keep things real, you still want to obey to the rules of photography. If you're using a wide lens you don't abuse depth of field because, in reality, you won't get too much of it. Another great tool of Fstorm is the Focus tool. While rendering you can click on a specific point in the image and put it in focus, then play with depth of field values to intensify the bokeh effect. We have allowed one week of work to create this animation from start to finish to illustrate the effectiveness of CGI in the field of industrial design. The 3D animation and the images created are perfect material for a presentation and used as a web commercial. For this project, we have used 3ds Max 2017, Fstorm render and After Effects. There's no Photoshop or any kind of post production / compositing effect added to the animation or the stills. The rendering engine works so well that we didn't feel the need for it. The process included the 3D modelling of the TV, lighting, shading and rendering of the stills. We've then created an animatic to preview the animation before sending it to render. The rendering of the animation itself took less than a single day's time at 1280x720. After a round of comments, we've changed few shots and decided to render the animation again to fit the music better and then edited it in After Effects. The footage shown it the animations is an edit of the following royalty free video available under creative common license. Pitching for Brand Identity with CGI and Motion Graphics. 3D Visualisation of a Boeing 777 aircraft interior. Modeling and Rendering in 3ds Max & Corona Renderer. Why manufacturers are replacing photography with full CGI production to sell their products. A subscription business model for 3D production service.